"Hopefully it will focus in on what is still needed to be explored," Flake said. Republican Senator Jeff Flake reiterated two things multiple times in New Hampshire tonight – he is not sure about running for president, nor is he sure about his vote for Supreme Court nominee Brett Kavanaugh. Speaking to a very friendly crowd of politically savvy New Hampshire residents at St. Anslem college, the Arizona senator said he planned to wait until after the FBI came back with its updated background investigation to decide about voting up or down for Kavanaugh's confirmation. Flake revealed that he urged a "fullsome" investigation, and the FBI, he said, had reassured senators that they could do their work in a week. He said the investigation needed some limits in its scope, though, to avoid encouraging additional “baseless” allegations, but that "hopefully it will focus in on what is still needed to be explored," he added. (Andrew Harnik/AP, FILE) Supreme Court nominee Brett Kavanaugh, a federal appeals court judge, testifies before the Senate Judiciary Committee on Capitol Hill in Washington, Sept. 5, 2018, for the second day of his confirmation hearing. Asked whether he was thinking of the late Senator John McCain, his former colleague from Arizona, last week when he initially called for the FBI investigation into the allegations against Kavanaugh, Flake did not hesitate to say, "yes." "John was always a mentor to me. He always talked about due process and regular order. I don’t want to say what he would have done. I thought the Senate needed more time," he said. "I was thinking of two institutions: the Senate and the court.” He added that the court needed protecting and that it is one of the last institutions Americans trust. 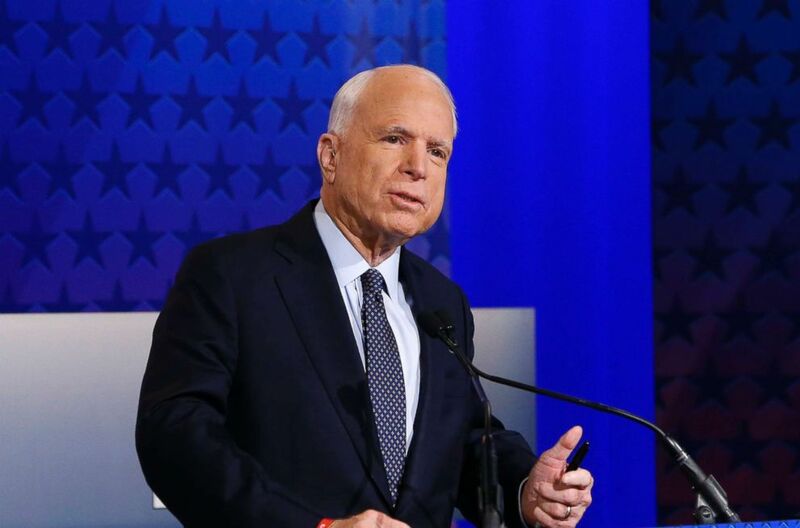 (Ross D. Franklin/AP, FILE) Sen. John McCain talks with debate moderators prior to his debate with Rep. Ann Kirkpatrick, their only scheduled debate before next month's general election, Oct. 10, 2016, in Phoenix. 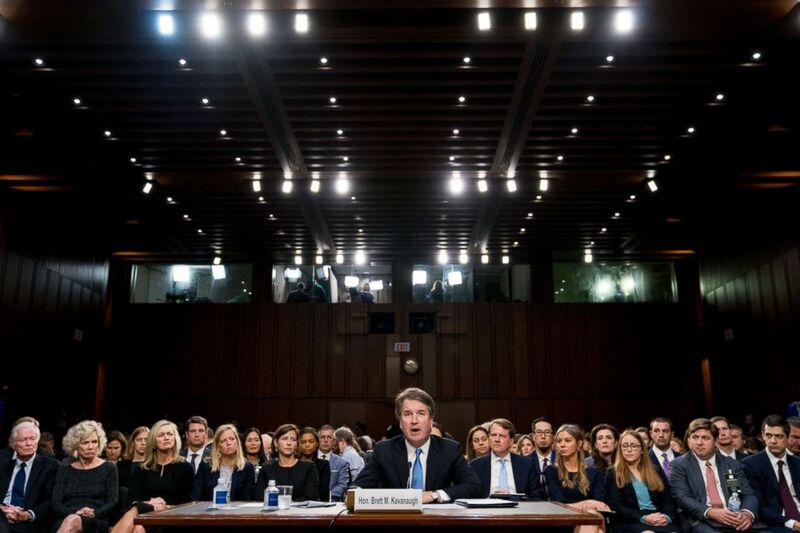 As for the bullish and at times aggressive behavior Kavanaugh displayed during the hearings last week --- as well as his references to partisan politics and the Clinton political machine -- Flake said he thought the judge deserved some "leeway" given the circumstances and avoided commenting on whether he thought that temperament displayed by the judge was an issue for the confirmation. The bulk of Flake's prepared remarks sounded similar to other speeches he has given in the past around the country and on Capitol Hill, calling for compromise and the end to "tribalism." He urged his colleagues to reach out beyond their "tribe," and base of voters. "I’m a proud conservative and lifelong Republican. That does not make Democrats my enemies. America has too many real enemies to indulge such nonsense," he said. "Tribalism is ruining us. It is tearing us apart ... It is no way for sane adults to act ... The only tribe for which any of us owes any allegiance is the American tribe," he stated. Like many in the crowd, Danielle Blais said she wanted to see the Supreme Court confirmation process slowed. She thanked Flake for his decision to demand an investigation before voting. "I appreciate very much what he did on Friday to put the brakes on what seems to be a railroad nomination going through come hell or high water," she told ABC News before Flake began his speech. Bruce Nest, of Nashua, New Hampshire, said Flake's move was a "real act of honor ." "We've been waiting for somebody to take that leap and show what America is all about and then finally this guy steps forward and do it. I gotta hand it to him," he said. After listening to the senator's remarks, Nest said that even though he was a Democrat he would consider voting for Flake, if he ran in 2020. 'If we had 50 more like him in the senate, we could make the country work again."